Shirakawa STAR is one of CIRC2LE STARs in General Medicine. Shirakawa STAR is an endowed department jointly founded by Fukushima Medical University and Fukushima Public Welfare & Agricultural Cooperatives Association, within the CIRC2LE. Its clinical activities and education will be based at Shirakawa Kosei General Hospital, known to the local community by the name “Shirakawa General Medicine Center”. Japan precedes other nations in the world in experiencing a demographic transition to a super-aging society. 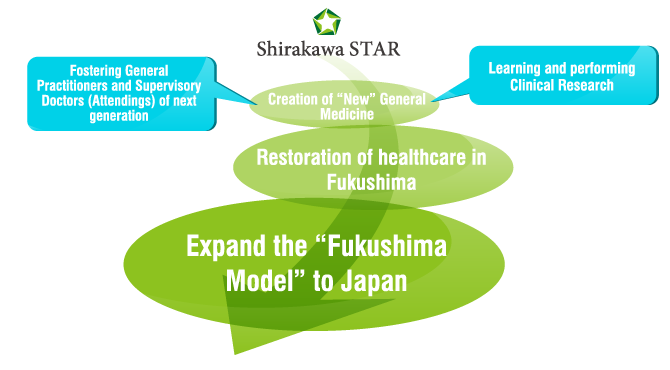 To meet the new healthcare needs our society face, Shirakawa STAR will set its goal to nurturing doctors who are able to respond competently to challenges such a society presents. Capacity to function as attending physicians – both in hospital general medicine and community medicine. Communication skills necessary to connect hospital general medicine and community healthcare. Ability not only to “search” and “use” evidence, but also to “create” evidence needed to effectively serve the elderly. Background and purpose of the foundation of the Shirakawa STAR Since Japan has turned into a super-aging society, it is now very common for each elderly patient to have multiple organ diseases or symptoms. This comordity makes it increasingly difficult to have their conditions be treated separately by appropriate specific organ subspecialists. Because of this circumstance, there is an urgent need and strong expectation for general medicine doctors, who are capable not only to see each organ but also to see the patient as a whole. In addition, the importance of healthy life expectancy – to live in health to the end stage of life – is being increasingly stressed. To realize healthy life expectancy, we must work harder on prevention of diseases as well as prevention of becoming bedridden, not just providing care when they are ill. However, so far, Japan has not done well in producing general medicine doctors who are capable of both clinical practice and prevention. To this end, Fukushima Medical University and Fukushima Public Welfare & Agricultural Cooperatives Association agreed to jointly establish a endowed course focusing on the education of general medicine doctors and publication of research that contributes to better clinical practice as well as prevention of illness and loss of function. Shirakawa Kosei GH is the core hospital in the southern part of Fukushima Prefecture, with 471 beds, covering medical service area population of 190 thousand people. It operates sufficient variety of specializations so as to fulfill all the medical needs of the community. Southern Fukushima is the third worst area in terms of medical service, suffering from shortage of physicians, only preceded by Soso and Minami Aizu medical service area (Ministry of Health, Labour and Welfare, Survey on physicians, dentists, and pharmacists, 2012). Human resources development of General Practitioners in this area, therefore, is a pressing issue even within the Fukushima prefecture. On-site clinical training by full time attendant(s) (associate professor or assistant professor) who has enough experience in medical education of general medicine and emergency care, internal medicine. Experienced attending doctors at distinguished Japanese hospitals who offer clinical residency program support, as visiting professor or project professor, in the planning of residency program. The doctors will visit Fukushima regularly to supervise clinical rounds. Senior residency programs in general medicine, with focus on hospital general medicine but also including emergency medicine and community medicine. Training in clinical research for residents by fulltime faculty members who have excellent background and experience in clinical research in the field of general medicine. 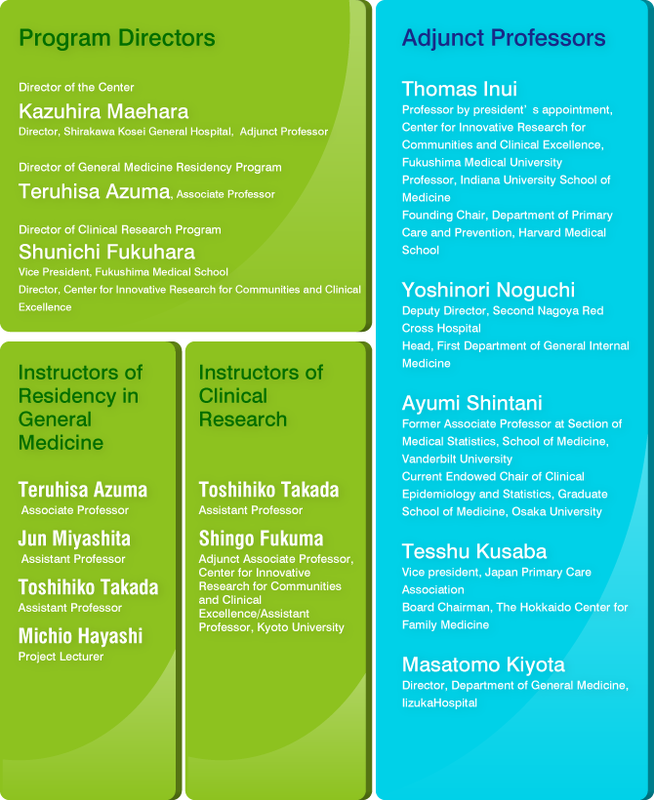 Training in clinical research by the faculty members of CIRC2LE, Fukushima Medical University, and Department of Healthcare Epidemiology, Kyoto University, who have excellent background and experience in clinical research, its methods, and training for this domain.